Alexandria Ocasio-Cortez has not been sworn into her new role as a New York congressperson but she is making new enemies daily. She has battled Rep. Nancy Pelosi, declared war on her own party and made mistakes in civics that have made her a laughing stock. And now she has taken aim at former Alaska Gov. Sarah Palin, Fox News reported. Newly elected Rep. Alexandria Ocasio-Cortez and former Alaska Gov. Sarah Palin are trading barbs on Twitter. 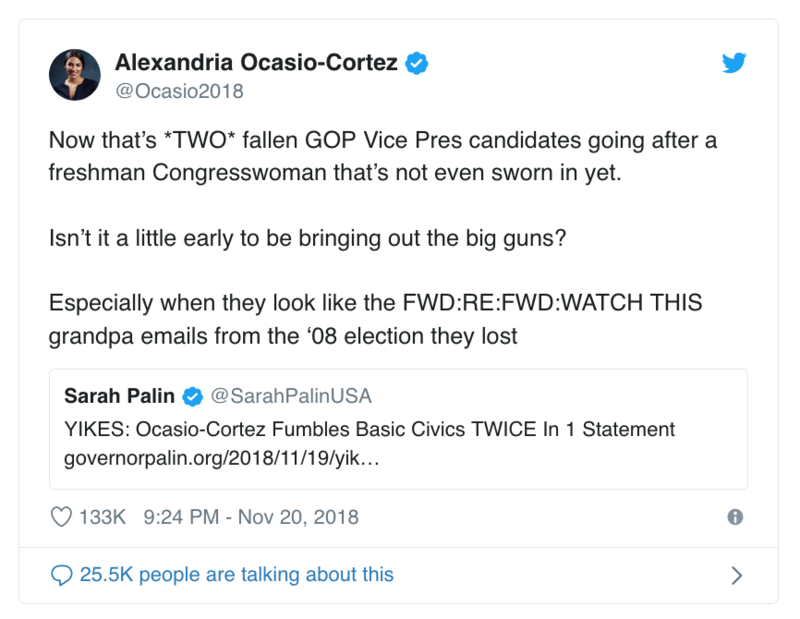 Palin’s tweet came alongside an article from governorpalin.org, which included a screenshot of a Twitter post from Ryan Saavedra, a reporter at The Daily Wire. The reporter on Sunday evening shared a video of Ocasio-Cortez making a mistake when talking about the government. “If we work our butts off to make sure that we take back all three chambers of Congress — uh, rather, all three chambers of government: the presidency, the Senate, and the House in 2020, we can’t start working in 2020,”’ Ocasio-Cortez is heard saying on the video. Ocasio-Cortez fired back, turning the conversation to health care. “Maybe instead of Republicans drooling over every minute of footage of me in slow-mo, waiting to chop up word slips that I correct in real-tomd (sic), they actually step up enough to make the argument they want to make: that they don’t believe people deserve a right to healthcare,” she tweeted. In a follow-up to her retort aimed at Palin, Ocasio-Cortez revealed on Twitter Tuesday that the other vice presidential candidate she had been referring to was “Lieberman,” seemingly referring to 2000 Democratic vice-presidential candidate Joe Lieberman.